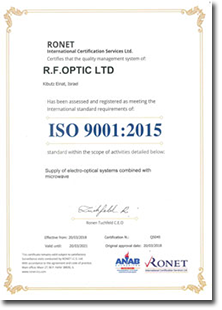 RFOptic’s quality policy conforms to the management system standard ISO 9001-2015 and to all the national and international applicable standards. The Company is committed to supplying products and services that fulfill the customer’s stated requirements and expectations. The Company’s commitment to quality is made by ALL of the company employees and subcontractors and as such is an integral part of their responsibilities. The company uses non-hazardous standards and is RoHS compliant. The Company will supply all of the resources needed to implement an effective quality system. It is the Company’s policy to achieve continuous improvement of quality by setting measurable goals. RFOptic’s activities in all areas stress non-conformity prevention, with the emphasis of building quality into our products and services. RFOptic’s Quality System is an integral part of the management methodology of the organization and is designed to enhance and perpetuate the reputation of the Company as a designer and manufacturer of reliable quality products. Quality has no limits. As a company, we are committed to an continuous process of ongoing improvement.